In the four decades since its humble beginnings selling goods at flea markets, Ocean State Job Lot has transformed into a widespread enterprise. The first permanent store opened in Rhode Island in 1977, and the company has expanded steadily to become the largest closeout retailer in the Northeastern United States. 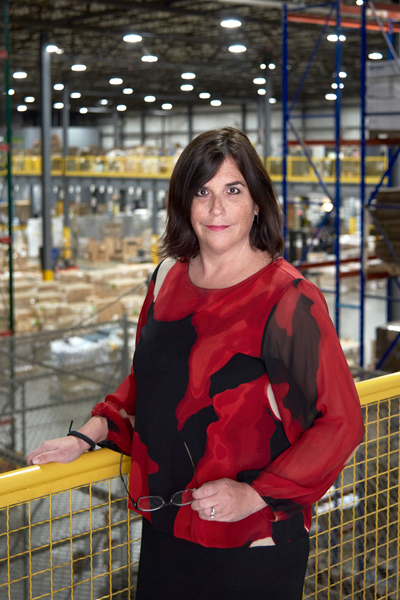 Today the discount retail chain comprises 133 stores in eight states, soon to be nine states, with sales exceeding $700 million annually, and now looks to its legal leader Tracy Baran to spearhead future opportunities for growth. OSJL’s history is a classic entrepreneurial effort that turned a strategy of helping people save money by acquiring lower-cost inventory and selling it at bargain prices into a thriving business that appeals to a wide range of consumers. While the business plan sounded simple, growing the company to what it is today required a well-coordinated effort with leaders from several business disciplines collaborating across their areas of expertise. Baran, general counsel, joined the company in 2011, when it encompassed about ninety stores. The attorney plays a key role in guiding Ocean State Job Lot’s expansion efforts. Her work includes supporting real estate deals; assessing how varying state regulations impact the business; developing and updating workplace policies for more than 4,000 employees; and ensuring compliance with intellectual property laws and authorizations to sell closeout merchandise. All of these tasks are essential to growth. Her oversight of leases and property purchases has been critical to expansion. Baran partners with in-house and outside real estate professionals to reduce risks related to a property’s infrastructure such as heating and cooling system flaws, the condition of the roof and the parking lot, and special restrictions that could impact the business. A leaky roof or poorly functioning air conditioning should be the responsibility of the landlord in lease agreements, Baran says, so that the company isn’t burdened with high repair costs after taking control of the property. On purchases, maintenance issues can be used to negotiate a lower price. As the real estate professionals hash out these important details, Baran works to secure the best possible terms in the contract language. Most expansion locations are within retail plazas, according to Baran, and some of those have grocery store tenants. In some cases, the location may have an allowed-use restriction that forbids another food retailer from moving in. OSJL does sell food items, so any such restriction has to be waived for the deal to go forward. Typically, after explaining the company’s retail approach, supermarket tenants tend to see Ocean State Job Lot more as a complementary vendor than a competitor, according to Baran. Another area for Baran and her three-person legal team to impact financial returns of new locations is state labor and employment regulations. “States have been more active in lawmaking in this area in recent years,” she says. For example, five of the eight states where the company does business have enacted mandatory paid sick time laws. These laws vary significantly by state. Some require one hour of paid sick time for every thirty hours worked; others require one hour for forty hours of work. Some states require an employee to work ninety days before earning sick time; others mandate 120 days. Such variables cause complexity in employment policies, since the company has had to decide whether to have a single companywide sick leave policy or vary it by state. For a companywide policy to work, Baran says it would have to adhere to the state regulation with the most generous terms. OSJL has had a sick leave policy in place for many years as Baran points out, and it decided to keep that policy in place with adjustments for state laws when needed. “We expect all states will have mandatory sick leave at some point,” says Baran, adding that the company’s policy may have to change accordingly. Baran works closely with the OSJL’s HR chief on labor issues, especially on controversial topics such as sexual harassment. For example, a recent law in New York State requires all employees to undergo training on this issue within thirty days of the start of their employment. When opening a new store in New York, managers must schedule training for all store associates within that time frame. Baran’s team ensures that managers follow through with that requirement. It’s the kind of compliance assurance duty that reduces risk for the company. Risk management extends to other areas of the business such as purchasing. Baran’s team sometimes modifies terms on agreements from vendors that are having financial difficulty to ensure OSJL doesn’t make payments on goods until it takes possession of them. This prevents a scenario where a creditor puts a claim on merchandise after the retailer pays for it. Regular interaction with business leaders is vital for Baran to reduce such risks and keep the company on a fast-growth path. Coming to the company from a law firm environment, it took Baran a little while to figure out how to navigate optimally on the corporate side. One important lesson is collaboration. “You have to make sure that you have all of the right players at the table when holding meetings,” she says. Whatever the task, Baran sleuths the pertinent information from the area of the business most in the know. Although one of her chief roles is to protect the company from risk, she’s not one to try to quash new ideas and initiatives. “My role is to advise on risk and find a way to get things done,” she explains. OSJL is a privately held company that has maintained an entrepreneurial spirit as it has grown through the years, and Baran adds that for continued success, innovation within legal and across the business must be encouraged.